The other day, a good friend told me that she's been reading the Poldark series of books written by Winston Graham, for the third time. When I told her I'd never read them she expressed surprise. 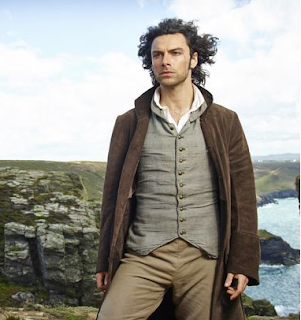 Apparently, Ross Poldark reminds her of Patrick in my books Torn and Inviolate. I'm always up for new books, and invite recommendations for interesting new reads, so I immediately downloaded the first book in the series for my Kindle. I haven't started it yet - I'm hurrying though my current book, another recommendation by a friend, but I'll tell you about that one another time. Back to Poldark - I was intrigued by the idea that my friend was reminded of Patrick, and I remember there had been a television series based on Poldark back in the 1970s. I was way too young to be interested in at the time although I vaguely recall it being popular. I started doing a bit of research and discovered that a new television series was released early this year and to my surprise, the lead role was played by the guy who played the vampire in Being Human - Aidan Turner. That in itself caught my interest because I enjoyed Being Human and always thought the vampire was kinda cute. So, I'm looking forward to starting the books - and I hope I enjoy it because I do love a good series. Now, the book I'm reading at the moment is interesting. I'm not normally a fan of medieval history, but I heard about these books at a book club I attend every month. A member spoke about a historical series by Patricia Bracewell. The first is called Shadow on the Crown, and the second, which I'm reading now is The Price of Blood. Much to my surprise, I'm enjoying these books very much. I went to bed early last night so I could get in some serious reading time - a terrific winter activity! So snuggled under my doona, with one of my cats to keep me company, I ploughed through the book. I expect to finish this weekend and will then be able to start on Poldark. Is there anything better than a really good book? It's truly one of life's greatest pleasures. In the meantime, I have no plans to write anything medieval myself, but I may have to rethink my attitude to this genre and check out a few others - after I finish Poldark, of course! Until next week, try a new genre. You never know what you'll find! Oh, and just in case you're not familiar with the nicely put together Mr Aidan Turner, here's a little pic I found on the appropriately named, Poldark and Handsome site.